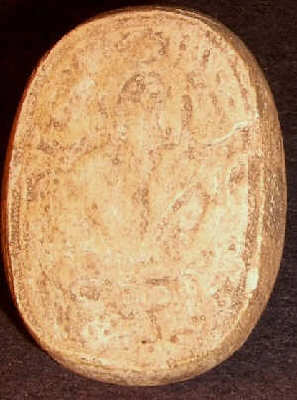 Sold on eBay by seller "K"
The item listed for auction is a "Thoth Scarab" from the New Kingdom Period(1539-1075B.C.). 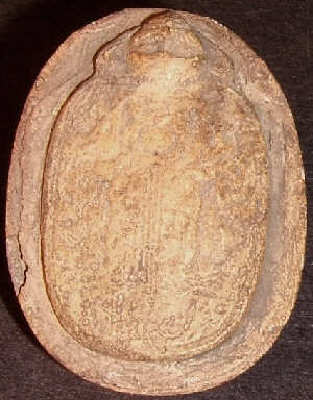 Carved from stone this type of scarab was either a common household item or a tomb relic. This authentic reliquary piece has the "baboon faced" god Thoth on the top front, with faintly visible figures on the upper surface and reverse. Due to extensive ancient age wear, these type of scarabs can be rolled out with modeling clay to reveal the "age worn", hidden reliefs. Measures approximately: 2.0 long, 1.5 wide and .7 in depth. In the last few centuries Egyptian archaeological discoveries were also available "to the highest bidder". They were removed from Egypt and were held in private collections worldwide. The items that we list on our site have been acquired from those said collections. Most of these ancient pieces were originally recovered from Egyptian tombs or other types of digs. As with most antiquities they will have surface age wear, areas of encrustation, some may have age cracks and in some there were repairs. This and all of the items we post have been confirmed to be authentic by reputable antiquarians. We strive to do our best in providing you with the most accurate dating and time guidelines on all of our pieces. We are confident and guarantee that the piece you are bidding is authentic and coincides with the listing description. Returns will be accepted if the item your receive is not as shown in the photos or is not as described on the auction page. If the item being returned does not meet the above said criteria, it must be accompanied by a written appraisal from a qualified antiquities expert. This is to include the antiquarian's name and credentials. We will no longer accept returns based on groundless supposition or on buyer's remorse.